As my homebrewing club, the Charlottesville Area Masters of Real Ale (CAMRA), was preparing the second batch of beer to fill our bourbon barrel, we encountered an unexpected surprise. As reported previously here, CAMRA purchased a used bourbon barrel to fill with stronger beers that would benefit with an oak and bourbon character. 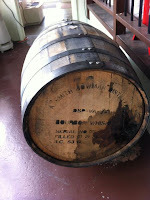 The first batch to fill the barrel was Denny Conn's Bourbon Vanilla Imperial Porter. After the first month, the beer tasted good, but lacked the full oak and bourbon flavors that the brewers desired. Last Saturday, after two months, the beer was removed from the barrel and a new flavor was encountered - sourness. Souring bacteria will eventually come to inhabit almost any barrel used to hold beer. Wood is a porous material that is difficult to clean and makes the perfect environment for lactobacillus and other acid-producing bacteria. Beer, in general, is not strong enough in alcohol content to completely prevent bacteria growth in the wood. Our homebrewing club knew this, but hoped to age several non-sour beer styles in the barrel before it turned. To help ensure the initial batches were not soured, we selected a barrel that contained spirits, instead of wine, whose high alcohol content would naturally prevent bacteria growth. The first recipe we selected was also a higher alcohol beer and we hoped that between those two factors, we would limit the likelihood of sourness. The sour bacteria could have come from two possible sources. First, the barrel was dry when we opened it, meaning that it did not contain any visible liquid bourbon. The barrel did release a strong bourbon aroma when opened, but the dry barrel staves could have started growing bacteria colonies coming in through air ingress as the barrel did not contain liquid. Second, and more likely, one of the batches of beer put into the barrel could have contained an infection. We did not taste the individual batches before putting them into the barrel, and in hindsight, we should have done that. However, even if each batch was tasted, the initial stages of bacterial infection might have gone unnoticed. Once mixed in with the rest of the beer, the infection would continue to grow and then lodge itself in the barrel staves. This would be slowed by the alcohol concentration in the beer, but it would proceed regardless. So, now the barrel is soured, the question is what to do. Some of the brewers of batch two have already started fermenting their wee heavies, the style selected for this batch. Most of us agreed that a soured wee heavy did not sound ideal, so that recipe has been discarded, leaving those brewers to complete the batch without the barrel. The main problem is that we might not have enough interest is sour beers in the club to generate the 50 gallons of wort required to fill the barrel, regardless of recipe. If that turns out to be the case, then the barrel may well become a planter. Has your homebrewing club encountered the problem of an unexpectedly soured barrel before? If so, what did you do about it? Never have I barrel aged, but I would think the occasional annual group strong wild ale would make way better use of the barrel than turning it into a planter. Gardens are graveyards for oak barrels, don't throw R.I.P. letters on it yet. Experiment, go crazy - an imperial cream ale dry hopped to hell with nelson sauvin hops in the barrel!!! Thanks for your comment, Idoit. The ideal case is for our club to have enough people interested in barrel-aged sours to brew a batch to fill it. I am not sure that we have enough, even with those who are interested brewing multiple batches. We will find out at the next club meeting. Thanks for taking the time to respond to the post.